When roller debarkers were introduced in the ’90s, they quickly passed drum debarkers as the on-mass debarker of choice for debarking large volumes of pulpwood. But people cling to what they know, and some companies still maintain and buy new drum debarkers. There’s a number of reasons why roller debarkers surpassed drums. They save on maintenance and help produce better product. What is a Drum Debarker? A drum debarker is what its name suggests: a big drum, which acts like a tumbler. Smaller ones come in roughly 10’ diameters, bigger ones in 18’ diameters. Logs go into the debarker on one end, and the drum tumbles the logs around as it spins. Ridges called rifters inside the drum assist with the tumbling. Log-to-log contact is what does the debarking in these machines. According to Dennis Widdifield, sales engineer with Biomass Engineering & Equipment, that’s really the best way of debarking in terms of fiber loss. But in winter, drum debarkers will not debark well—frozen logs do not peel easily. Drum debarkers will just polish the outside of bark. To overcome this difficulty, drum manufacturers introduced wet drums—drums that used water to treat the bark. But using water was problematic because oils and resins from the bark would mix with it, resulting in a toxic solution that needed treated. Manufacturers then tried using steam to pretreat the logs. But steam changes the bark’s properties, and once the steam condenses, the resulting water still needs treated. What is a Roller Debarker? A roller debarker is in many ways like a drum debaker. It’s an on-mass machine: you feed it multiple logs at a time. The machine also rolls them around and debarkes them using log-on-log friction. After debarking is complete, the operator lowers a gate, over which the logs discharge. The main difference between a roller debarker and a drum debarker is how the debarkers roll the logs. Roller debarkers use a series of stepped rollers at the bottom of a rigid, tubular housing. The rollers are equipped with abraders, which act like small hammers. As the rollers turn, the abraders knock the wood, cutting the bark and pushing the logs up the side of the housing. When the logs reach the top, they roll back down over the other logs, where the process starts again. All this time, the logs are rolling against each other, which encourages peeling. The abraders themselves differentiate a roller debarker from a drum debarker. A drum debarker is equipped with rifters on the inside of the drum, but unlike the abraders in a roller debarker, these rifters don’t cut into the bark; they simply lift and tumble the logs. Abraders have the advantage over rifters because of the cuts they make. These cuts literally kick-start the peeling process by giving the bark a place to start peeling. Friction still does most of the debarking. There are two types of roller debarkers: closed bottom and open bottom. Closed-bottom debarkers capture the debarked material under the rotors and transfer it to a conveyor. Roller debarkers were originally designed with closed bottoms, and many still use this design. Open-bottom debarkers were developed for reclaiming. The rotors and abraders in open-bottom debarkers act like disc screen. Rotors interlink with the abraders so that unwanted material doesn’t pass through. The abraders and rotors can be adjusted. Roller debarkers surpassed drum debarkers for good reasons. Drum debarkers are expensive, and they require time-intensive maintenance. Every seven to ten years, maintenance crews must to replace the log rifters, also called “stays,” in the drums. They need replaced because when they wear too thin they can collapse. The drum will then no longer work. Replacing the rifters is anything but simple. Whenever this work needs done, a huge crew of welders must come in, cut off the old rifters, and weld in new ones. It takes weeks. And you can imagine how this impacts production. It’s not often something that can be accomplished without hiring temporary workers or contracting with a maintenance firm, either. Another issue with drum debarkers is corrosion. Bark and water exits the debarkers through slots between the stays. Due to the acidic nature of wood and the the oxidizing effects of water, the metal around these slots corrodes and weakens. Eventually, the metal cracks. These cracks, too, must be welded. There are also large components that wear and need replaced. The drums turn on very large rollers. The debarkers employ high-horsepower drives (500hp is typical). And the drums are driven with big, mining-sized pinions. The gates, too, need replaced. Big components mean big costs and bigger difficulty when replacing them. Performance is another area where drum debarkers fall short. They don’t work with frozen wood well. You can place frozen logs in a drum debarker for hours, and the debarker will just polish the bark. Drum debarkers also can result in high fiber loss and high bark content left on the logs. For example, one major paper company decided to install a new finish drum (instead of a roller debarker) at their mill in 1998. They ran it for 10 years. Dennis Widdifield, upon visiting, saw a large chart up on the wall of this mill where management had been charting fiber loss. For ten years, they hadn’t met their target. They wanted 1.25 percent bark left on log but were regularly left with 6-7 percent, especially in winter. In 2012, this mill finally put in new rotary debarker (120’ long, 4 modules). It started without a hiccup. 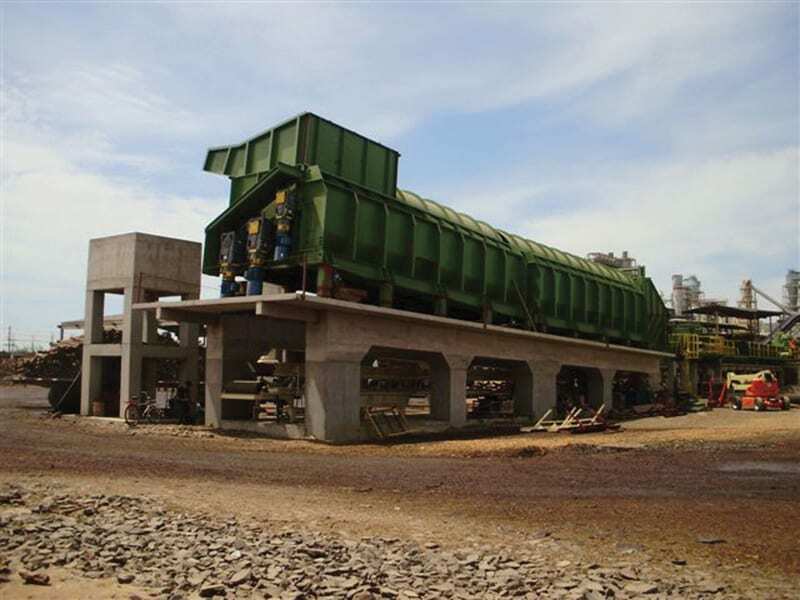 Nearly seven years later, it is still debarking 120 tons per hour and handles surges up to 380 tons per hour. And fiber loss is significantly down. Fiber loss now runs between 0.5-1 percent. Bark left on the wood averages 0.75 percent. You can get a very good product using a roller debarker, and you don’t get the fiber loss. Another advantage of a roller debarker is that it is highly adjustable. By changing the abraders and speed, you can easily adjust it for species and the weather. This can’t be done with drum debarkers. If you buy the wrong drum or if you change the wood species, you can end up dead in the water. Last, roller debarkers have the advantage over drum debarkers because they are versatile. Because they can be adjusted, they’re able to handle different species of wood. They can handle softwood and hardwoods. They can handle frozen bark and even species with stringy bark. Whatever your challenge, it’s likely that a roller debarker can handle it. Biomass Engineering & Equipment offers a world-class roller debarker proven to handle large quantities of pulpwood on a daily basis. Want to learn more? Click the button below and fill out the form on the landing page to receive information about our roller debarker. This article was posted in General and tagged roller debarker. Bookmark the permalink. Follow comments with the RSS feed for this post.Post a Comment or leave a trackback: Trackback URL.